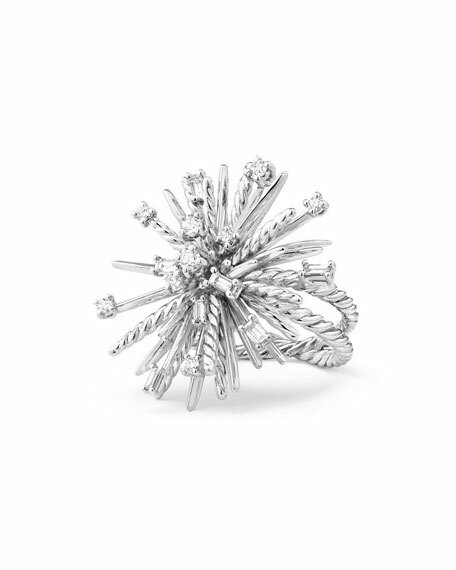 David Yurman ring from the Supernova Collection. 18-karat white gold crisscross band with cable motif. Baguette and round-cut white diamonds detail face. 0.47 total diamond carat weight. David Yurman ring from the Albion Collection. Split sterling silver band. 18-karat yellow gold bezel. Faceted smoky quartz or champagne citrine face. Pavé diamond trim. 0.22 total diamond carat weight. Approx. 0.4"W (11mm). Made in the USA. David Yurman ring from the Châtelaine® Collection. Sterling silver double-spiral band. 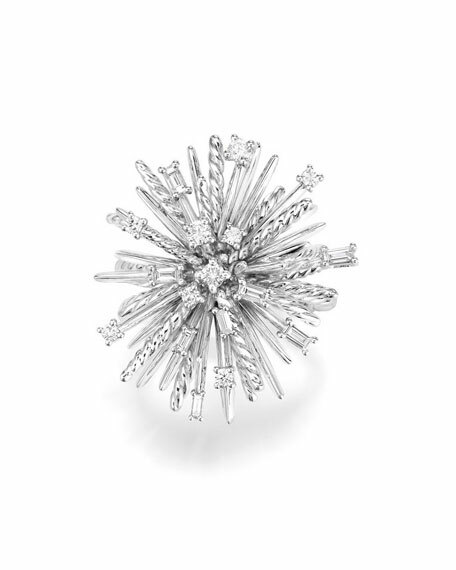 Pavé diamond prong setting. 0.05 total diamond carat weight. David Yurman ring from the Châtelaine® Collection. Sterling silver double-spiral band. Pavé diamond prong setting. 0.05 total diamond carat weight. Your choice of faceted lemon citrine, amethyst, hematine, or green orchid (lemon citrine with hematine backing). Face, approx. 11mm (0.4"). Imported. David Yurman ring from the Châtelaine® Collection. Sterling silver double-spiral band. Pavé diamond prong setting and halo. Your choice of faceted Lemon Citrine or Black Onyx, 9mm (0.4"). 0.14 total diamond carat weight. Imported. David Yurman ring from the Albion® Collection. Polished sterling silver with 18-karat yellow gold. Cushion face in choice of black onyx, champagne citrine, or reconstituted turquoise. Approx. 0.7"H (18mm). Made in USA.